Amazon certainly didn’t invent online retail, and they weren’t even first in a number of strategies that have proved successful for them. But it seems they are winning the game with better execution than their competition. Think: Amazon Go, same-day delivery, Amazon Prime, immediate credit on returns, not even having to physically return some items to get credit, and augmenting deliveries with their own delivery network. With success comes imitation, and most retailers are scrambling to keep up. They are relaxing their return policies, promoting online order pickup in store, trying to perfect inventory accuracy and looking for other ways to get merchandise to the customer quicker. As with anything new, some strategies work, and some don’t. Walmart’s effort to leverage local brick-and-mortar employees to make deliveries is a perfect example. In June 2017, Walmart’s US e-commerce CEO Marc Lore announced the initiative with great fanfare. Called new and revolutionary, speed to customer was the goal. Walmart was already shipping thousands of orders to local stores for customer pickup. Why not use store employees to deliver those packages to customers and save customers time and effort? For extra income, a store employee could sign up as a delivery driver to deliver packages to customers on their way home from work. Associates could choose how many packages they would deliver, complete with size and weight limits. They could also choose the days they were available. Walmart would issue deliveries to associates based upon their route home, thus minimizing time and distance. With 4700 stores across the United States and more than a million associates, it seemed like a no-brainer. As we mentioned, some unique ideas aimed at chasing Amazon work. But in this case, industry watchdogs were correct in their early predictions that employees delivering packages was fraught with potential problems. The RetailWire BrainTrust panel warned that attempts to leverage in-store employees as delivery drivers could lead to big trouble. Bob Phibbs of the Retail Doctor noted that Nordstrom used to encourage employees to deliver packages on their way home, but accidents and other problems stopped the practice. Tom Dougherty, CEO of Stealing Share, opined that there were too many landmines in Walmart’s initiative to have a happy ending. Other industry experts were equally negative. It turns out they were right. Months after the associate delivery pilot program began, Walmart quietly retreated and ended the plan altogether in January 2018. The initiative failed to gain traction with skeptical Walmart employees, many who felt they were being taken advantage of, despite the extra pay. Walmart moved on and tested a more modest service with four handpicked employees delivering groceries from a store in Woodstock, GA. [Walmart is aiming to be able to deliver groceries to 40 percent of US households by the end of 2018.] They also tried a delivery partnership with Uber and Lyft, but that didn’t work. 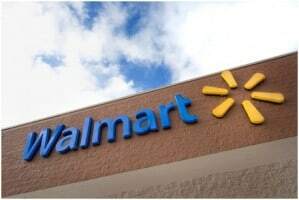 Undeterred, Walmart is continuing to study ways to rely on third party companies such as Postmates and Doordash to help deliver groceries. So, retailers chasing Amazon continues. No doubt there will be hundreds of ideas and experiments in the near future in an effort to keep up with or even outpace the retail online giant. It will be interesting to see what new ideas succeed. As I often say, time will tell.